Ideal for running bottles or containers with high precision. Typical filling ranges are from 1 gram to 10 LBS. 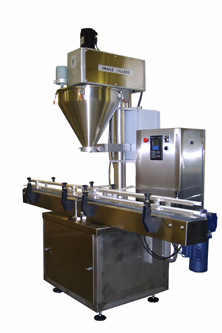 The Image 3500 utilizes a stainless steel automated conveyor with indexing pins to move the container down, stop it under the fill station and fill, then index it out of the fill station. The filler can be mounted on a stainless steel frame or a full size enclosed Stainless Steel base. Multiple augers may be needed to run different fill weights. A Servo motor and PLC are utilized for higher precision and keeping product fills in memory. Stainless steel enclosed base (as in picture above).